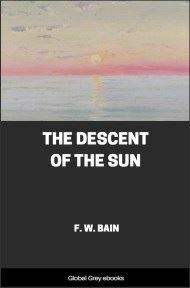 The Descent of the Sun is a fairy tale that F. W. Bain found in an old Hindu manuscript. In it we can enjoy amazing scenery of a fascinating yarn, while at the same time stopping to consider the nature of existence; the purpose of incarnation, reincarnation, the power of attraction and the triumph of love. 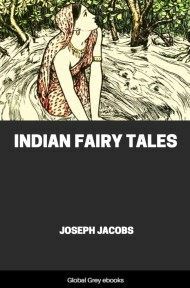 HERE is a fairy tale which I found in an old Hindoo manuscript. 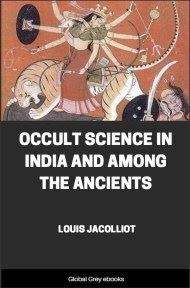 As the title shows, it is a solar myth. Literally translated, its name is: The glory of the Going Down of the Sun. But this is only the exoteric, physical envelope of the inner, mystical meaning, which is: The Divine Lustre of the Descent (Incarnation) of Him Who took Three Steps: i.e. Wishnu, or the Sun, the later Krishna, or Hindoo Apollo. And this epithet of the Sun is explained by the well-known passage in the Rig-Weda (I. 22. 17 ), 'Three steps did Wishnu stride: thrice did he set down his foot.' A mythological expression for the rise, the zenith, and the set of the Sun. But the old magnificent simplicity of the Rig-Weda was perverted by subsequent Pauranik glosses; and Wishnu, according to the new legend, was said to have cheated his adversary, Bali, by striding, in his Dwarf Incarnation, over the three worlds. In our title, a different turn is given to the old idea, which we may express by saying that the steps commence, not with the rise, but the set of the Sun: his Going Down, his mysterious period of Darkness, his Rising again. This is the inverted Race, or Cycle of the Sun, which so much exercised the mind of primitive man, and seemed to be a symbol of the mystery of Birth and Death. And ours is a strange story; which seemed to the translator not unworthy of being clothed in an English dress, containing as it did so much in little bulk that, as the French say, donne à penser. Absolutely Hindoo in its form and spirit, it is for an Englishman full of associations, and instinct with that philosophical mythology, scraps and fragments of which are familiar to him in the story of the Fall and the poetry of Milton, in many an old fairy tale, in some touches of Pythagoras and Plato, and some old religious legends. Lux in tenebris: a dazzling light, in the most profound darkness: the night of the sun: a heavenly body, doomed to put on mortality and suffer for a period in this lower world of darkness, birth and death: in some such ways as these we may express its central idea. But for the reader not acquainted with Sanskrit it may be worth while to point out that there runs throughout it a veiled allegory which he would not be apt to detect, to the teaching of the Sánkhya Philosophy of Kapila, (who is older than Thales;) according to which it is the duty of PURUSHA, the archetype of the spirit of man, the Primæval Male, to hunt for and pursue PRAKRITI, the feminine personification of material Nature, the Eternal Feminine, till he finds her: when instantly she disappears 'like an actress .' In this respect, the story somewhat recalls the Gita-Gowind of Jayadewa, which according to one school of interpreters, deals with the Soul, personified as the lovely Rádhá, in its search after the Divine. For among the Hindoos, the earthly and the heavenly love are always confounded. And let not anyone suppose, that the lesson embodied to these pages is obsolete or dead in the India of to-day. I wrote the last lines of this translation late one evening, and I walked out in the dusk to the bridge across the river, about half a mile away. There was not a breath of air. It was a night as still as that which long ago Medea chose on which to work her spells: nothing moved save the twinkling stars; all below was plunged in sleep, every tree a picture, every leaf seemed carved in stone: only, every now and then, a flying fox burst screeching from a branch. And as I stood upon the bridge, I could hear a faint din of tom-toms coming from the distant city of the Peshwas. I looked westwards, up the river. The sun had set, leaving behind it a ruddy glare which faded higher up the sky into the darkness: and exactly on the confines of the colours, in that bath of nilalohita, that purple-red, which is a favourite epithet of the god Shiwa, hung, like a thing in a dream, the lovely streak of the new moon, one day old. All was reflected in the still mirror of the broad sheet of water formed by the river Bund, or dam. I turned round. On the eastern side, below the bridge, the river runs in disconnected pools. All was buried in dark and gloom. But about two hundred yards away, on the right bank, there was a red spot and leaping flames. They were burning on the bank a corpse, whose former owner had died of plague. For here in Poona it is now, as it was of old in the days of Homer, αἰεὶ δὲ πυραὶ νεκύων καίοντο θαμειαί. . . . Suddenly a voice said behind me: They burn well on a cold night. I looked round. Beside me stood a Hindoo, whose real name I do not think it lawful to mention. His white clothes were stained and splashed all over with red, for the Holi festival had left its mark on him. Why, Wishwanáth, I said, what are you doing here? Or have you come, like me, merely dekhne ke wáste, to see the sun set, and 'eat air'? Wishwanáth cast a careless glance at the sky. Yes, he said, it looks well from here: but then I have seen it so often. It was a new moon yesterday. And very soon it will be old. Look, Wishwanáth, here is a strange thing. See, there on that side is the moon, following the sun to rest in a bath of fire, and they will both appear to-morrow all the better for it. But now, look down there. There is another thing passing, away in the fire. But how will it be with that? And I pointed to the burning pyre on the other side.